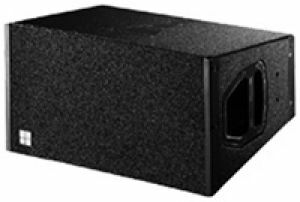 The d&b Q1 loudspeaker is a passive two-way loudspeaker housing two 10″ LF drivers positioned in a dipolar arrangement and a 1.3″ HF compression driver fitted to a toroidal wave shaping device. The 75° constant directivity horizontal dispersion pattern is maintained down to 400 Hz, while the vertical HF dispersion of 15° allows the Q1 to be used to construct vertical columns that produce a curved coherent wave front. The mechanical and acoustical design of the cabinet enables vertical splay angles to be set between 0° and 14°. Q1 cabinets can therefore be used in vertical configurations starting from two cabinets with a 15° to 30° dispersion, up to twenty cabinets with a fully user and venue defined vertical profile. The Q1 cabinet is constructed from marine plywood, incorporates a pair of handles and has an impact resistant paint finish. The front of the loudspeaker is protected by a rigid metal grill covered with replaceable acoustically transparent foam, and two EP5 connectors wired in parallel are mounted on the rear panel.